So, you’ve made the decision: It’s time to buy a guitar. Maybe you’re new to the music world, are transitioning from a different instrument or are a seasoned veteran looking to expand your musical repertoire. Either way, you’re probably wondering whether you should buy a new or used guitar. This guide will touch on a few things to keep in mind while you’re shopping around. There is no right or wrong choice when it comes to debating between a new or used guitar — it all depends on your lifestyle. Many people gravitate toward the latest, most heavily advertised models that are sold at top dollar before considering the alternative. If you’re about to go into some guitar shops and stare longingly at countless new models you’d love to stuff into your car and never look back, take a moment to consider the pros and cons of buying a used instrument. If you decide on buying a new or used guitar before shopping, you’re less likely to make a purchase on impulse. Affordability: If you find a guitar that’s been taken care of over the years, the fact that you’re not the first one to hold and play it doesn’t take away from its quality, but it does take a huge amount off the bottom line. Saving money on a completely playable and quality guitar with a few scuffs and smudges may sound like a decent tradeoff to you. Variety: Guitars can circulate for decades before they lose their quality and functionality, which means those that are brand-new take up only a small percentage of the guitars in the world. 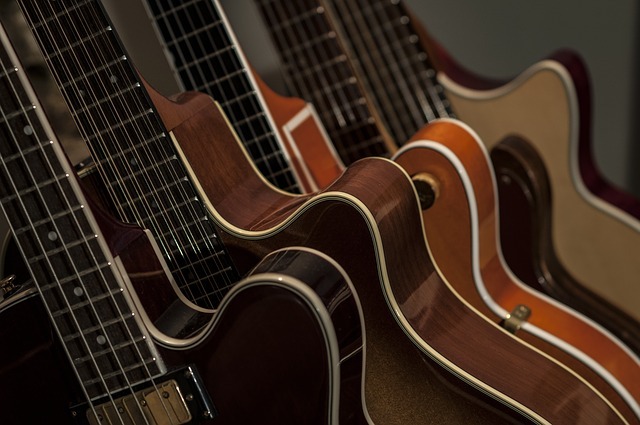 When you buy used, you’ll have access to a much wider array of guitars, and you’ll also be able to evaluate sonic character that has developed throughout the life of the instruments you test. Just about every musician knows that moment when an instrument feels right. The wood in guitars, electronic components in synths and speakers on amps all change over time, often for the better when it comes to sound. Character: If you’ve been a musician for a long time, you know there’s a lot more to an instrument than the physical features and manufacturer. Gibson, Fender, electric, acoustic — these are important, sure. But what sticks with you are the stories that come with that guitar. Where were you when you first played it? How did you feel? A used guitar comes with its own stories. Depending on how or where you purchase it, you may even be able to connect with other musicians who have used the instrument. Payment Up Front: There’s no denying purchasing a new guitar comes with certain perks, including that you’re often able to finance them. With a used guitar, you’ll usually have to foot the bill up front or provide compensation for the instrument by trading in an old piece. Lack of Warranty: Some music shops will give you a warranty on a new guitar for an additional cost. Many who advocate for a used instrument prefer the feeling that they can heavily play their guitar without worrying about putting scratches or smudges on it, but some people want the look and feel of a brand-new piece they can protect from damage for as long as possible. Once you’ve made your decision about used or new, stick to it. We’re not saying you can’t ever change your mind if you find an instrument you fall in love with and decide it’s the perfect fit. However, it’s important to decide which option is the most reasonable for your budget and lifestyle before you set foot in a music store and falling prey to sales representatives pushing you toward the best, loudest and shiniest new guitar. Don’t go alone. It’s no secret that a salesperson can often talk you into a product you didn’t necessarily have your eyes set on. Having someone there with you — a close friend, family member or musical mentor — can give you someone to talk through your options with who will listen and respond honestly to the situation. Get their opinion on how you sound playing the instrument. If they can also play guitar, ask them to strum a few notes while you listen from different distances. Decide how you feel playing the instrument. Although it may be tempting after hours of searching for your new product, don’t make snap decisions. After all, you left your home with the mission to find a musical tool — going back without one can make you feel like you wasted a day. That feeling, however, is better than living with an instrument you’re not entirely satisfied with. You’ll need to go with your gut a little on this one, but play each guitar in the shop enough to get a decent feel for it before buying. If you’ve decided to buy a new or used guitar, congratulations! Now you can start seeking the perfect fit. If your next step is to buy a used guitar in Milwaukee, you’re in luck. At Record Head, you’ll find a buying and selling hub for guitars from countless leading manufacturers that are beautiful in both appearance and sound. We’ll always go above and beyond to help you find the right instrument to start learning your new hobby or add to your current collection. We look forward to helping you discover your sound at the right price, with price guarantees. Contact or visit Record Head in West Allis today!